We hear about the High Court in the media quite often. You may have read headlines claiming that a constitutional expert has given advice to someone to take a case to the High Court. But what does that involve and what should we know about the High Court’s role in our democracy? Here at CEFA we have decided to write a non-legal introduction to how the High Court operates and the power of it under the Australian Constitution. The High Court of Australia is the highest court in the Australian Judicial system, with its origins in the Australian Constitution. The functions of the High Court are to interpret and apply the law of Australia, to decide cases of special federal significance including challenges to the constitutional validity of laws and to hear appeals. Laws made by the Parliaments in Australia must be made with proper constitutional authority and it is the High Court that ultimately decides whether legislation meets this requirement. You might wonder how democratic it is for an unelected court to have the power to declare whether laws made by a democratically elected parliament are invalid. However, our written Constitution is a higher law. One role of the High Court is to examine and compare legislation made by Parliaments to the Constitution and then declare whether it is inconsistent with that higher law. If someone believes that the Government has created legislation that is outside the bounds of the Constitution they are allowed to ask the High Court to decide whether the legislation is constitutional or not. For Constitutional cases the full bench of seven Justices sit. As well as examining the words in the Constitution, the Justices consider history, previous decisions and the principle of law. The courts have difficult choices to make in constitutional interpretations, often involving values and policy considerations….and a court’s decision creates constitutional policy. If the High Court finds a law to be unconstitutional it means the legislation is invalid. The Government must then change their policy. One recent case that CEFA wrote about earlier this year was Senator Bob Days challenge to the new Senate vote rules. The High court found that the legislation was valid. On the other hand, in 2012 the High Court found the Federal Government’s funding arrangement of the National School Chaplaincy Programme to be invalid as Section 61 of the Constitution did not empower the Commonwealth to enter into the Funding Agreement. In an attempt to overcome this the Government enacted the Financial Framework Legislation Amendment Act which was also challenged in the High Court in 2014. The High Court found that the new legislation was invalid as it went beyond the scope of Parliament's power under the Constitution. Later in 2014, to make the funding arrangements valid, the Federal Government made an agreement with the States and Territories whereby the school chaplaincy program could be run by the each of the States and Territories and Federal Government funding was provided through grants. Our system of Government is a federation of States and Territories. We have nine Parliaments, including the Federal Parliament. Sometimes these Parliaments disagree or make legislation that is not consistent with each other. The High Court is the umpire in these conflicts and makes decisions that affect the law in both the State and Federal Governments. 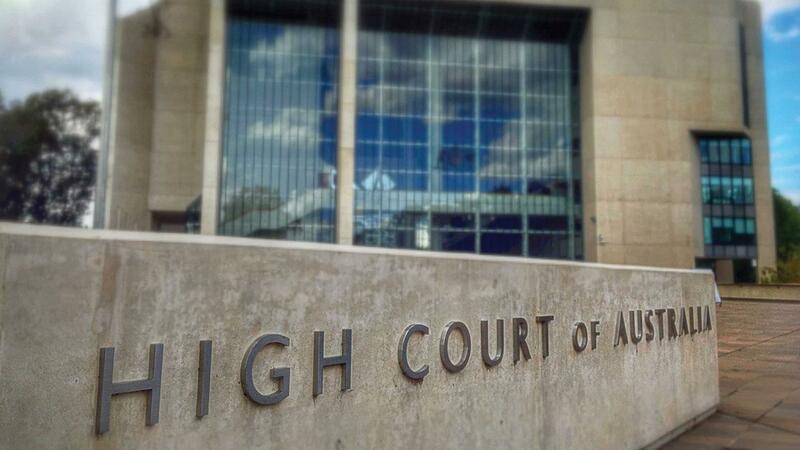 The High Court has the power to hear appeals from Federal, State and Territory Courts. Appeals are not automatic and must be applied for. Each Justice hearing the case makes his/her own decision and written reasons are provided. The Australia Act introduced in 1986 abolished appeals to the Privy Council. Since then any decision by the High Court on an appeal is final. This means that the High Court is the last court of appeal in Australia and decisions are binding on all other courts in Australia. An appeal heard earlier this year in the High Court that captured a lot of media attention was the case of Gerard Baden-Clay. He had originally been found guilty of murdering his wife by a jury in the Supreme Court of Queensland. Baden-Clay appealed the verdict in the Queensland Court of Appeal where his murder conviction for killing his wife was downgraded to manslaughter. The new decision was then appealed to the High Court. The case was heard by five justices of the High Court who found that the Court of Appeal had made an error when they determined that the original jury's verdict of guilty of murder was unreasonable. The original murder conviction was reinstated and the Baden-Clay case has now exhausted all appeals. You can read the reasoned judgement here at the High Court website. So we know that the High Court is described in the Constitution, but how about we take a look at how the High Court was set up. The first draft or some call it the pre-convention draft of the Constitution was written by a Tasmanian called Andrew Inglis Clark. He had spent a lot of time in the US and appreciated their system of Government, especially the separation of powers. His early draft of the judiciary chapter had vested the judicial power directly in the Constitution and was written very similarly to Article III of the US Constitution. During the 1891 Constitutional Convention the committee of drafters set out on ship Lucinda for a working weekend over Easter. Unfortunately, Clark was unwell and unable to board the ship. By the time he did make it aboard the drafting committee, led by Samuel Griffith, had altered the judicial power in the Constitution by giving the Parliament the ‘power’ to establish a court. To a regular person this might not seem like much of a change, but it would have meant that the High Court’s power was weakened. At this stage the drafting of the Constitution was dropped and when it resumed in 1897 the wording was changed back to vest the judicial power directly in the Constitution. The judicial power remained in the final draft of the Constitution and was approved by the people of the six colonies in referendums between 1898 and 1900. The judicial power of the Commonwealth shall be vested in a Federal Supreme Court, to be called the High Court of Australia…. This section ensures that the High Court is independent of the Executive and the Parliament (known and the separation of powers). The Constitution came into effect on 1 January 1901, however Parliamentary action was still required to implement the framework of the Federal Judiciary. After considerable political debate the Judiciary Act was passed in 1903 and marked the beginning of the High Court of Australia. One of the early drafters of the Constitution, Samuel Griffith, was appointed as the first Chief Justice. Sitting alongside him was Edmund Barton who had been our first Prime Minister and Richard O'Connor. Because these early Justices had been involved in writing our Constitution they had a good understanding of the intentions of the Constitution and as such were comfortable using their power. Samuel Griffith was instrumental in setting the standards of the High Court. Many of the players (Ministers, Parliamentarians, Judges) within our democracy in this early period had been involved in creating our Constitution and as such understood their roles. As a Federation there is a power sharing relationship between the States and Territories and the Federal Government. The Constitution was written with this relationship in mind and the drafters defined the roles of each level of government for the time. But since 1901 community expectations have changed and our democracy has evolved. The High Court has played a role in this. Decisions that the Court has made have influenced the changing relationship between the States and the Federal Government. Power has moved from the States to the Federal Government. This power relationship often underlies federalism discussions and tensions between the States and Federal Governments. The first notable case effecting federalism wasn’t until 1920, when the High Court found that Commonwealth Conciliation and Arbitration Court rulings were binding on State Governments, in what is known as the Engineers Case. At the time, and for some people even today, this case was ground-breaking. The Constitution had been interpreted by the Court to meet the needs of 1920 Australia and this was different from how it had been envisaged beforehand. One of the next cases that further established the increasing power of the Federal Government was the Uniform Tax Case in 1942. As a war-time measure the Federal Government passed legislation giving the Commonwealth the exclusive right to collect income tax. Four States challenged this legislation in the High Court and lost. The High Court found that it was within the power of the Federal Government to collect income tax and exclude any state from receiving grants from the Federal Government if they collected their own income tax. Another notable case that diminished the power of the States is the Franklin Dam Case in 1983. In this case the High Court found that Federal Government’s external affairs power granted by Section 51 of the Constitution gave them the power to halt the Tasmanian Governments plans to build the Franklin Dam. Effectively this meant that international agreements and treaties ratified by the Federal Government also applied to the States. Since then there have been numerous state laws overturned on this basis. By vesting the power of the High Court directly in the Constitution the people who wrote our Constitution ensured that we have a powerful and independent Court that is a check on the Executive and Parliamentary branches of Government. We also have a final Court of appeal for cases heard in other courts and an umpire to sort out disagreements between Governments. We hope this introduction to the High Court might encourage us all to delve more deeply into the essential role the High Court plays in our democracy. Over the coming months we are going to be giving you a lot more information about this crucial institution.